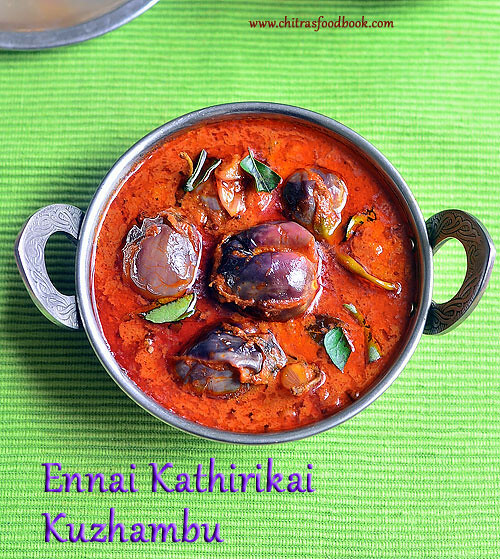 Basically ennai kathirikkai kuzhambu ( Oil roasted brinjal gravy) is prepared by using freshly roasted and ground spices with coconut.I make my MIL’s pepper flavored ennai kathirikai kulambu at least once in a week as it is Sendhil’s one and only favorite brinjal recipe. Recently I tried this easy, no grind, Chettinad style ennai kathirikai kuzhambu without coconut just for a change. I followed the recipe from THIS BLOG. I loved it a lot with plain rice and papad/appalam. 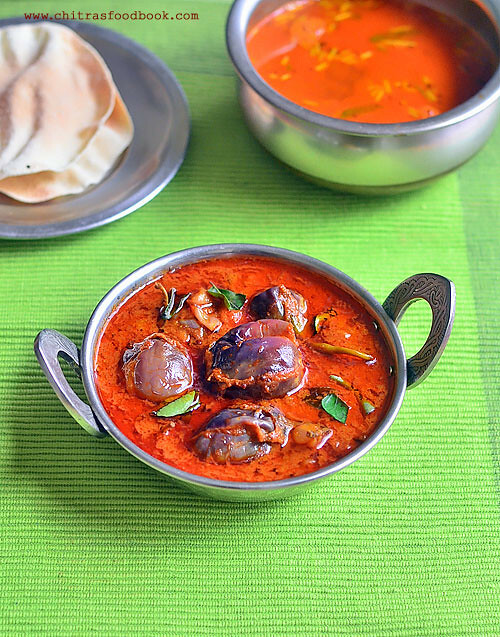 Its more like my vatha kuzhambu recipe but the flavor of masala coated, roasted brinjals in lots of oil makes a great difference in taste, color and flavor for this kuzhambu. Soon I will make a post about authentic ennai kathirikai kuzhambu recipe. Before that, do try this easy version. I hope you will like it . Now lets see how to make Chettinad ennai kathirikai kuzhambu with step by step pictures ! 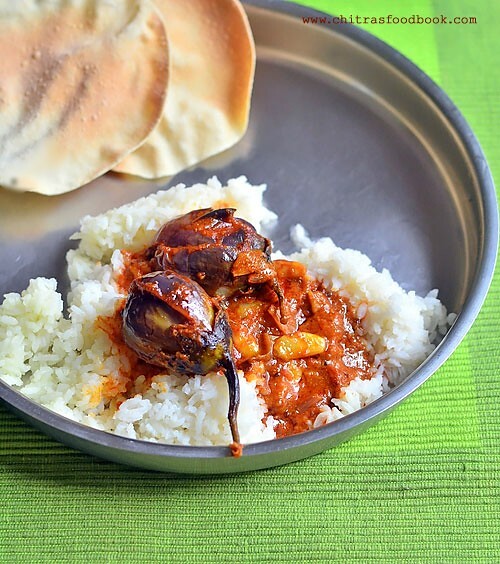 Don’t forget to check out my Ennai kathirikai poriyal , Brinjal masala kuzhambu , Brinjal masala fry, brinjal gravy for biryani ! Wash the brinjal. Mark X on the top of brinjals till half its way without cutting its stem part. Immerse them in water till use. Soak small lemon sized tamarind in 1 cup of hot water. Take the extract and set aside. Peel onion, garlic and keep aside. In a small bowl, take 1 tbsp tamarind extract, red chilli powder, dhania powder, turmeric powder and salt. Mix well to make a thick paste. Fill the brinjals with this paste.Arrange in a plate. Heat 1/4 cup sesame oil in a pressure cooker base ( I used cooked to make the gravy quickly and to save time) Reduce 1 tbsp oil if you feel too much of oil. You can make this gravy in a kadai as well.Splutter mustard seeds, methi seeds, curry leaves.Add the small onions, garlic cloves and saute till onion turns transparent. Add the masala stuffed brinjal pieces along with the remaining masala and saute well till the brinjal shrinks a bit.Add finely chopped tomato pieces, mix well for a minute. Add tamarind extract, 1/2 cup more water, salt and mix well. Let it come to a roll boil. Cover and pressure cook for one whistle in very low flame.Let the steam release by itself and then open the lid. If cooking in a kadai, cover with a lid and cook till brinjal turns soft and gravy turns thick as you wish. Gravy thickens and oil oozes out. Mix well and serve with plain rice, papad ! Do not reduce the quantity of dhania powder as it helps to thicken the gravy. You can replace red chilli powder + dhania powder with sambar powder too. You can also add a small piece of jaggery if you like. Add more chilli powder if you like spicy kuzhambu. This gravy stays good for a week even without refrigeration as we are adding more oil. Try this easy ennai kathirikai kuzhambu. Serve with plain rice, enjoy ! I had with plain papad. Yum! !